I have heard many variations of what graphic recording is from long-time experts, amateurs and even some casual hobbyist, and all of them are correct in one form or another, yet when a prospect or a non-practitioner needs an answer, I thINK understanding how it works adds more clarity. Pictures do help or I wouldn’t be doing this! Show your next prospect, supervisor or friend this sketch or one of your own, to illustrate how graphic recording works, then pull out a pen and show them. Actions are far better than words. 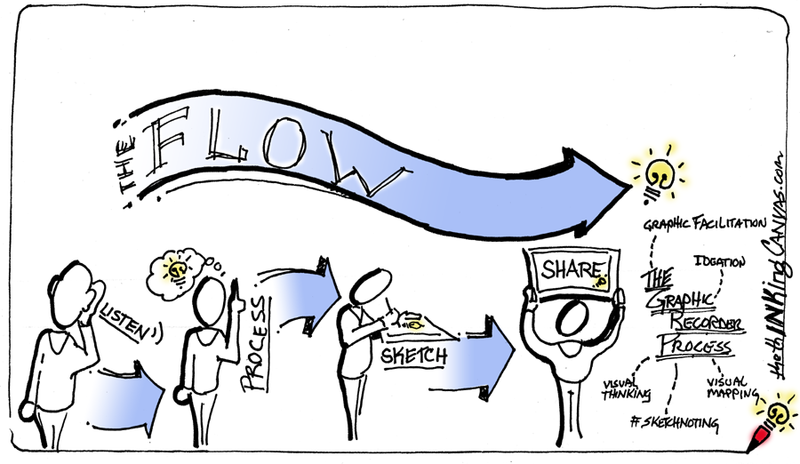 Heck, if you call yourself a visual thinker or graphic recorder, prove it by drawing it out. Literally. Okay, okay, stepping down off my soap box now. So, go with the flow and start recording in sketchbooks, back of napkins, notebooks, scrap pieces of paper, whatever, just do it. Today! Until next time, keep with the flow (ink that is) and start out sketchy. They’ll understand.